While waiting at the bus station in Motohakone for transportation back to Hakone-Machi and the Fujiya Hotel I, being the restless (or ever vigilant — whichever you prefer) shutterbug that I am wandered the nearby harbour in search of last minute captures before the sun disappeared behind the hills. This golden rendering of the setting sun is my favourite image from that wait. Getting on the Ropeway in Hakone to see Mount Fuji in all its conical splendour was a feat in itself for me when we visited 18 months ago. I don’t like heights or enclosed spaces, and at the time I was suffering panic attacks for inexplicable reasons. I didn’t need to create a reason to have such an attack thousands of feet above the valley floor. But, as mentioned in a previous post on my Fuji experience, it was either ride the Ropeway with my partner and friends or be left behind at our hotel. So, arming myself with everything I thought I’d need to distract myself from the tyranny of anxiety, I embarked on as high above the Earth a journey as I’d ever experienced. And I managed it just fine. The happy result is these, and other, images which remind me if I hadn’t stepped up I would have lost out. What have you done to step out of your comfort zone while travelling. Let me know. I’d love to hear about it. 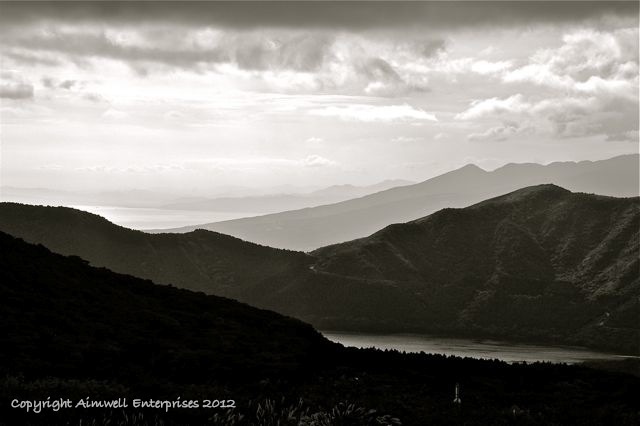 I’ve travelled a lot in the past couple of years, and loved every minute of it … well almost every minute. On the odd occasion I’ve been beset by attacks of anxiety in confined spaces, like narrow medieval castle stair passages and packed tourist buses. I’ve learned to cope by distracting myself with things like photography and tuning into soulful vocal stylings of my favourite Canadian singer/songwriter, Jacob Moon. 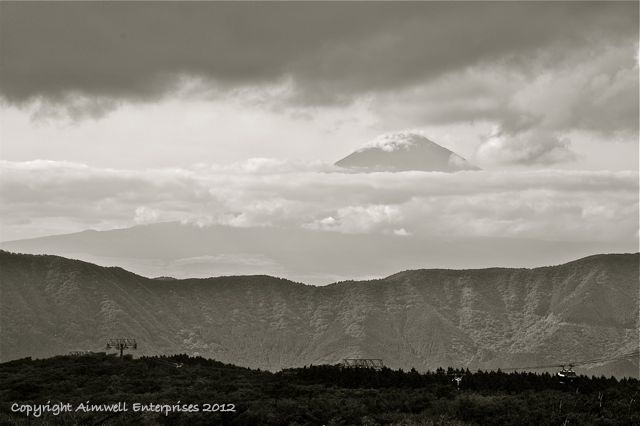 In Japan we had the opportunity to visit Mount Fuji. 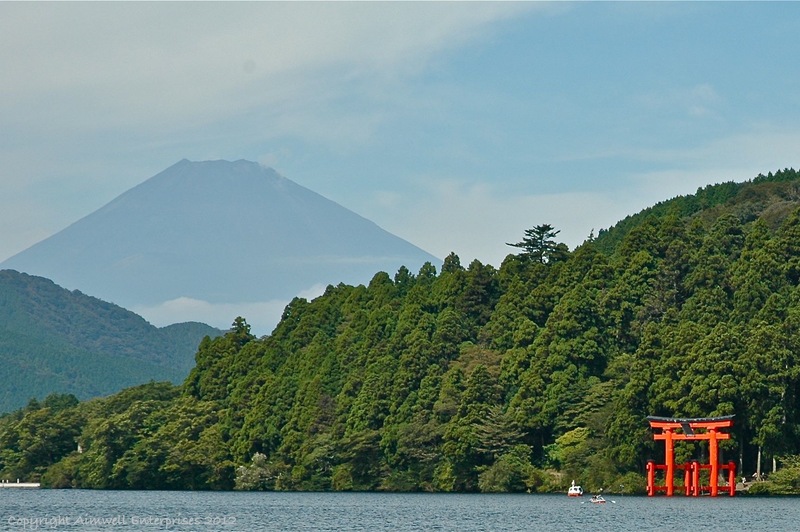 We stayed in the Fujiya Hotel in Hakone and decided, upon recommendation, that we would take the three-hour ropeway circuit to view Mount Fuji. Prior to our departure to Japan I’d been having severe panic attacks (which I now have under control) and so was quite nervous about sitting in a gondola suspended hundreds of feet above the mountains just so I could have a view of a volcano that may or may not make an appearance, depending on the weather. So, I mustered myself — packed my iPod, my camera, my chewing gum and Rescue Remedy, and joined them for the pilgrimage to view Fujisan. A shorter bus ride would have taken us to our destination just as well, but where’s the fun in that? The ropeway circuit includes the mountain train to the cable car; the cable car to the ropeway; the ropeway to the pirate ship highlighted in a previous blog and the pirate ship across Lake Ashi to Hakone-Machi where this shot was taken. I’m pleased to write that I self-managed my way through the circuit quite effectively, even managing, at one point, to stand in the gondola and look down into the valley plunging below us. Once I got used to the experience I actually enjoyed it. This may not be the most exciting image of Fuji you’ll ever see, but it reminds me that had I not taken what was for me a bold step toward addressing my fear of heights and enclosed spaces I wouldn’t have witnessed Fuji in its glory on what turned out to be the only clear day of our sojourn in Hakone. This is a minute I loved. Every morning I step up to my extensive cache of photos and wonder where we’ll visit next. There’s no apparent rhyme or reason, I just go where the spirit moves. 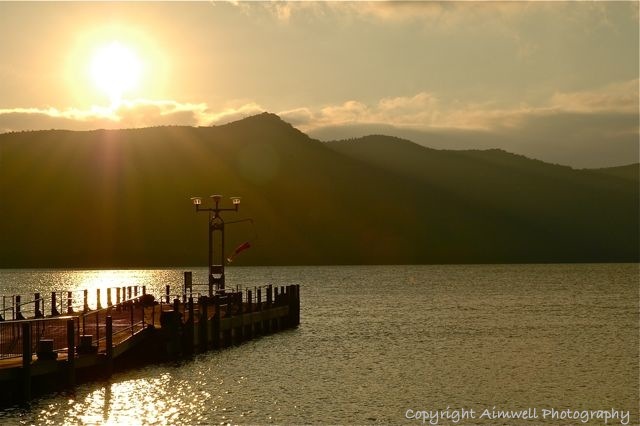 Today I’m guided to Lake Ashi in Hakone, Japan, which we visted in October 2010. 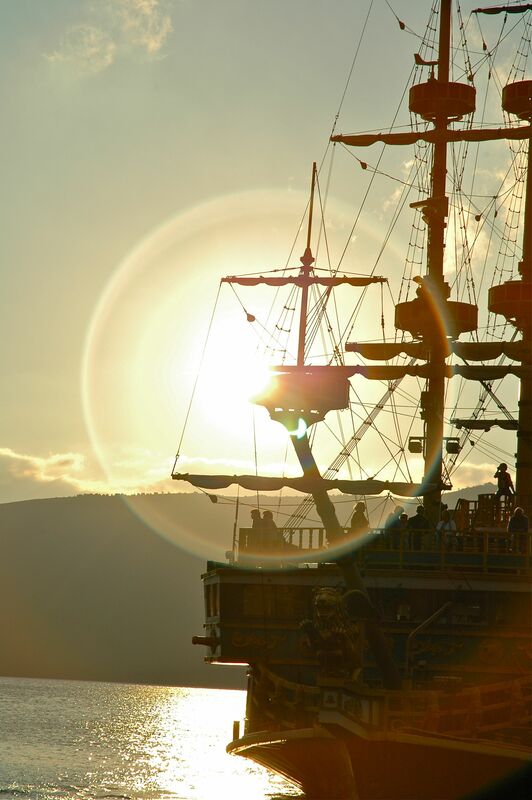 I took this photo from a similar replica “man-o-war” pirate ship that ferries tourists across Lake Ashi for views of Mount Fuji. It’s part of a three-hour circuit by mountain train, funicular cable car, ropeway (above The Great Boiling Valley), pirate ship and bus. It’s quite the journey and on a clear day the views are spectacular. But I had to face a couple of fears that day. 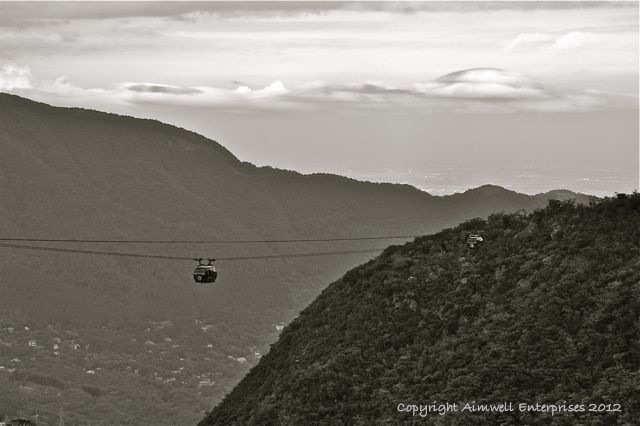 The ropeway, for instance, challenged my fear of being in a confined space hundreds of feet above the ground. (Distraction: Queue music – the fabulous Canadian singer/songwriter Jacob Moon). I had my reasons. I don’t want to sound like a wimp, but I’d been experiencing anxiety attacks in strange places in the weeks prior to our trip, and the thought of having one in a 12-seater compartment dangling from a rope way up high was not at all appealing. Taking lots of photographs was a distraction from my anxiety. I like to experiment and have a habit of taking photos into the sun as I love the effect of dazzling light bouncing off silhouette. I’m really happy with the way this one turned out. It reminds me of a beautiful sunny afternoon in Hakone when I stepped out of the darkness of my fears and saw the sun.